How Do I Buy a New Front Entry Door? Buying that perfect door, designed just for you. I want to replace my front door with a new one, but I don't know where to begin? One of the most common comments I hear from my customers is that “my current door is really ugly” or “it lets in a lot of cold air.” I want a new front door but I really don't know exactly what I want. Does that sound familiar? There are many options for new doors and the best place to start is to determine what you are willing to invest in your new entry door. Exterior doors can range in price from $150 for a standard size 6 panel single door off the shelf from a Lowes, Home Depot or Menards to $20,000 for a fully custom wood door with full lite decorative glass. This broad range can make it difficult to really narrow down your budget. I recommend checking out our blog “How much does an entry door cost?” to help narrow down material choices as well as give you ranges for each type of door. Once you have an idea what type of front door you are interested in and what level of investment you are willing to make, it is time to start your journey on finding your perfect new door. A great place to start looking at photo ideas is on Houzz.com. 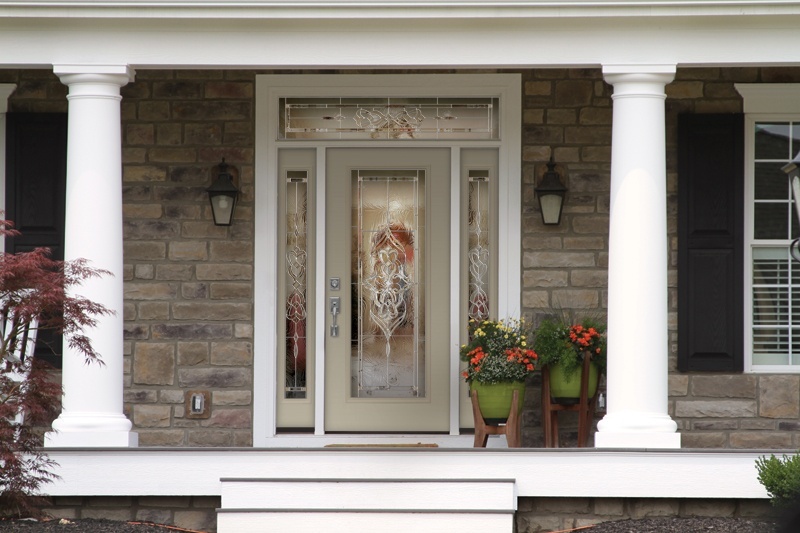 You can specify what style, material and even colors you like when searching for entry doors. 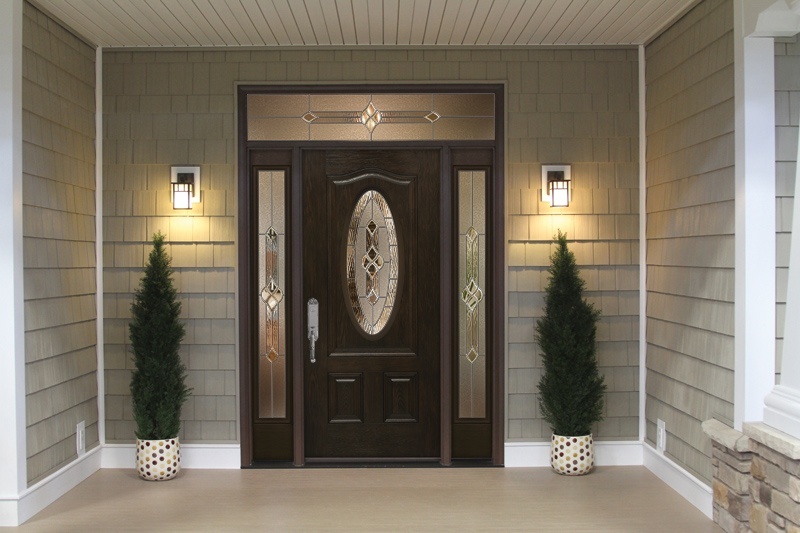 Exterior doors come in many different materials from Fiberglass, Steel, All-Wood, Aluminum Clad Wood and even Bronze. There is a large selection of different glass options as well. Clear glass with Low E to help with energy efficiency is a popular option. Privacy or decorative glass with caming details and designs or even hand painted designs are options available as well. Photos from websites like Houzz.com can help you narrow down your favorites. Houzz.com also has a section for “finding local pros in your area.” This is a great place to check out different retailers and installers for exterior doors in your own city or town. Many window and door showrooms also have full size display doors so you can touch and feel them in actuality. This is a great way to see what colors, textures and glass styles you really like. This way when you schedule an appointment with an Window & Door Consultant you have an idea of what you are looking for in your new door. If you have found some photos on Houzz.com or similar websites that you like, this is a good time to show your consultant the photos because that will help them in the design process. A good question to ask your Window & Door Consultant is whether he or she has visited the manufacturer where the doors are made? This helps determine whether your consultant has had specific training by the manufacturer. Some of the Window & Door Consultants that have had specific vendor training will be referred to as Window & Door Specialists. The next step with the consultant is the most fun of all. Thanks to technology, you can now see what your new door will look like on the front of your home before ever buying. For example, with the Provia Door App (a visual design tool), you and your consultant can build your dream door right there on the front of your house. The great thing about this tool is that you can see the price for your door as you build it that way you can make changes right away to get the price to match your budget depending on the selections you make. 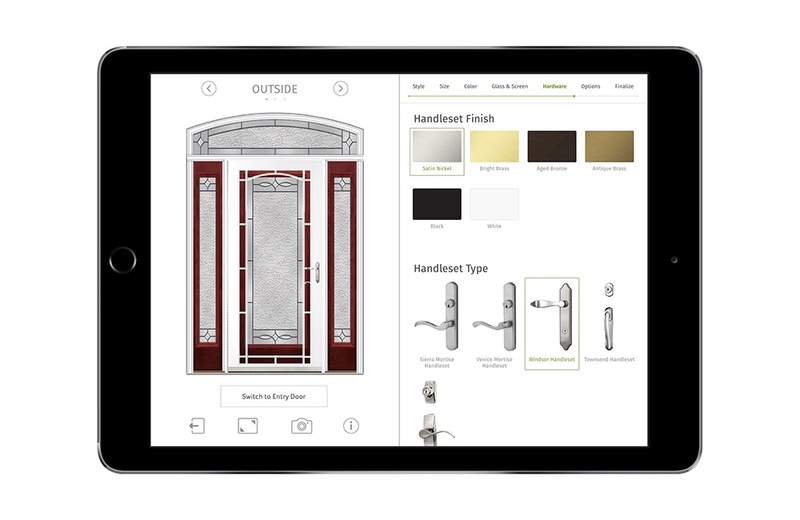 The app only works for Provia Fiberglass & Steel doors. In addition to selecting your perfect front door, you need to determine whether you plan to install the door yourself or whether you will hire a contractor to install your new door. Some retailers offer installation in house which is nice because both the product and labor warranty will be with the same company. Some retailers will give you some names and numbers of contractors that you can call to get quotes for the installation. The most important factors to consider with the installers/contractors is the labor warranty provided, their past experience with exterior door installations and most importantly whether you feel comfortable with the company you are dealing with. 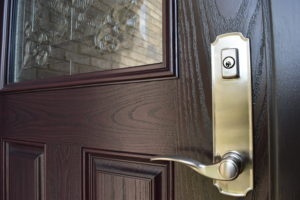 When it comes time to purchase your front door, some companies will have you pay for the materials at the time of purchase, being that they are special order materials. And then, you’ll pay for labor/installation upon completion. Other companies will have you pay a deposit of half down of the total project price with the other half due at completion. Both practices are commonplace. Most special order exterior doors take anywhere from 4-6 weeks to get in once the order is placed. Some specialty bronze or all wood doors can take 8-12 weeks depending on the selections made. This is something your Window & Door Consultant will discuss with you to help determine which type of entry door is the best fit for you. Another consideration when purchasing a new exterior door is whether you want it factory finished or whether you plan to stain or paint it yourself. This is one way to save money (DIY) however most door manufacturers specify in their warranty how quickly you need to paint or stain your new door so you do not void the warranty. Having the manufacturer stain or paint your new entry door is always a good option if you are looking for a turn-key process that comes with a factory warranty. This ensures your new front entry is protected from the elements (weather!!) as soon as it is installed. 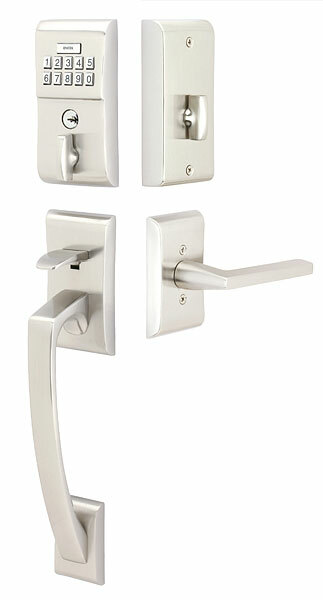 Last but not least, the finishing touches, you need to pick out hardware for your new door. This selection can really help your new door stand apart from all the entry doors out there. This is the “jewelry” for door. There are many hardware options available such as a standard knob and deadbolt to a full custom built grip entrance. Electronic keypads are a popular option as well so you no longer have to carry a key. Hardware is available in different finishes such as oil-rubbed bronze and satin nickel so you can find the perfect hardware that compliments your new door. Whether you are in the beginning stages of considering a new door to ready to take the next step, we are here to help answer any additional questions you may have. So, make sure to follow Franklin Window and Door to read some more informative articles, and to see what your next steps are in the window and door buying process.